Presenting an apple to their favorite teacher took on a whole new meaning for some students at Lenape High School when students were invited to nominate a staff member who made them feel like a member of his or her own family or went “the extra mile” to support them as part of this year’s Crystal Apple awards. 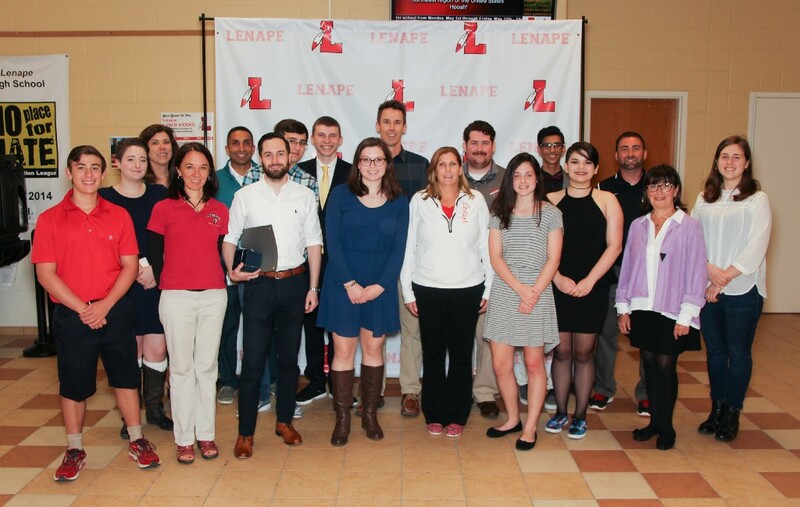 Students were asked to write an essay about a Lenape teacher, coach, counselor, nurse, secretary, administrator, custodian, faculty or staff member and their positive impact, inspiration, or influence in their lives. Students submitted the essays and poems about their teacher of choice, describing how that teacher made a difference in their life. According to Lenape, the winning essays were then chosen by the selection committee, and students were asked to read their essay to surprised teachers who displayed deep emotion when they heard the heart-felt words. Students described teachers they felt believed in them, took time to help them through difficult times, encouraged them to get involved, or displayed extraordinary patience and encouragement. Essays from the students also described teachers who enhanced their abilities to succeed in school and in life. Teachers were presented with a crystal apple as memento of the memorable interaction with their student. This year’s winning teachers (and nominating students) included: student Marykate Reick nominating staff member Sue Burns, student Glenn Hubbard nominating staff member Kim Condurso, student Sophie Mavrodin nominating staff member Mary Ann Stecher, student Mike Higgins nominating staff member Joseph Porco, student Emily DeSantos nominating staff member Brendan Moore, student Emily Ferguson nominating staff member Mary Pallis, student Amanda Smalfus nominating staff member Jeremy Knoll, student Jayen Patel nominating staff member John Carnevale and student Michael Donnelly nominating staff member André Lopez.